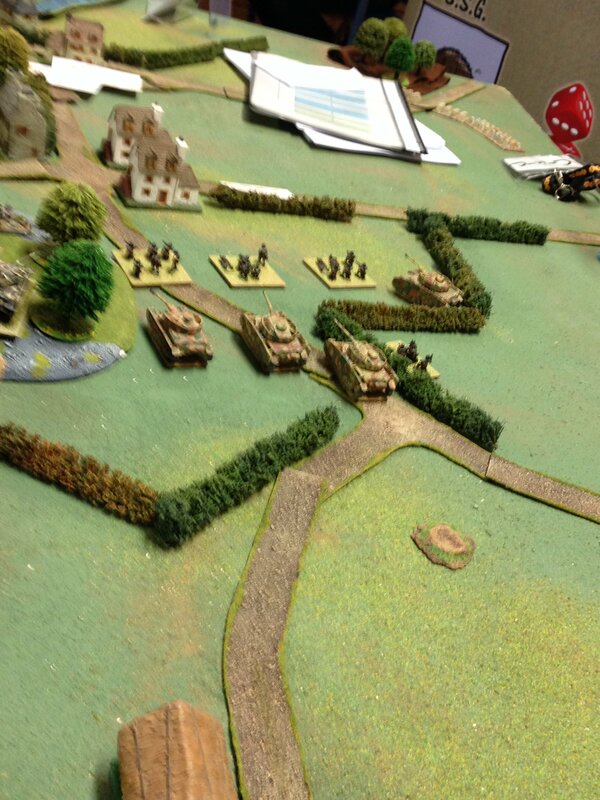 We had a good session at the Huntingdon District Wargames Club on Thursday last (13 August 2015). It was mainly a planning game, based on a session I’d designed for the Conference of Wargamers in July (I’d had to skip that owing to illness). The start of the scenario was 05:30 in the morning of 6 June 1944 in the HQ of Kampfgruppe von Luck (21st Panzer Division) just south of the 6th Airborne Division’s landing around Ranville and what later became known as Pegasus Bridge. The fiction of the game was that 21st Panzer Division has got its act together and is committing an early morning attack by a reinforced battalion and half a battalion of tanks, with supports, against the relatively unprepared British. Questions, discussion and non-definitive answers were around how, where and when to attack, what should be the fire plan for supporting the attack, and finally, what might be its impact given likely British responses. Orders were to take the bridges and eliminate the paratroops incursion on the east side of the Orne all the way to the coast. Other Kampfgruppe were dealing with the west side of the Orne, and the landings around the River Dives. 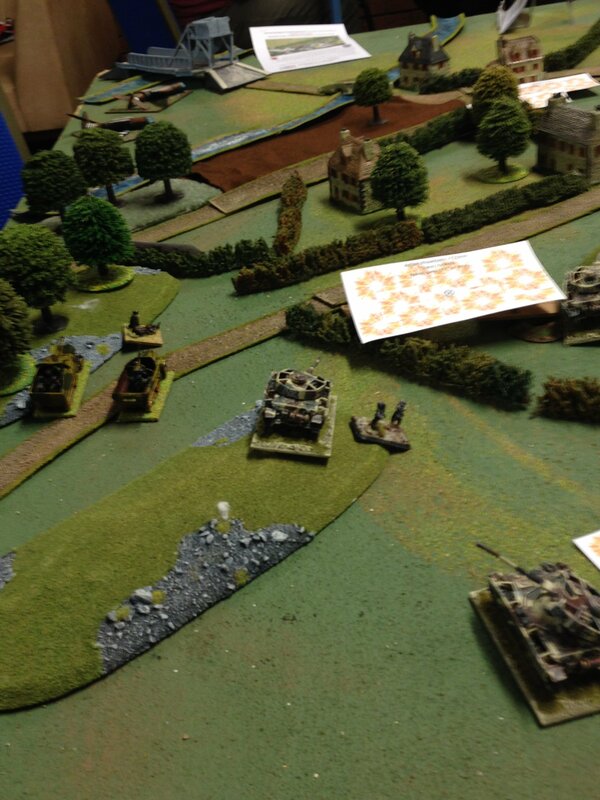 Prong A – Pz IV company, plus veteran Panzergrenadier company to attack Ranville from the south-west, with supporting direct fire assault guns. Heavy Pzgren company to swing wider to the west past the direct approach to Ranville to stretch the defence, and be ready to support a direct assault on the bridges. Prong B – Reinforced veteran Pz IV company, plus Panzergrenadier company to attack Ranville simultaneously from the south-east, with supporting direct fire assault guns. Short concentrated bombardment of Ranville by 2 batteries of 15cm guns while the attack moves forward. Supporting barrage of various hedge lines (likely British forward positions) by 10.5cm guns and mortars. Once Ranville had fallen, 2 companies of panzergrenadiers to secure it and its flanks, while the first 2 companies launched an immediate assault across the bridges. We didn’t have time to fight the full battle, but were able to deploy the troops and make some educated guesses about the potential results, as I’ve researched quite a bit about the historical deployments of both sides. Interestingly both 6 Division HQ and 5 Brigade HQ were in or very close to Ranville, and would have been caught in the bombardment, while the British deployment of AT guns to the hedge lines might well have lost these essential defensive elements too. Looking at the comparative strength of the two sides (bearing in mind that the paratroops were very under strength owing to relatively scattered drops), it seems highly probably that Ranville and then the bridges would have fallen within 2 to 3 hours of the 06:15 attack start time. “Prong A” – closing in on Ranville from the SW. Note the artillery bombardment on Ranville itself, and 4th (schweres) Kompanie on the left ready to move on le Bas de Ranville to give support to an assault on the bridges. I hope that we can fight the engagement through at another session! This scenario will form one of the variants of the “21 into 6 won’t go” set of scenarios currently being written up.